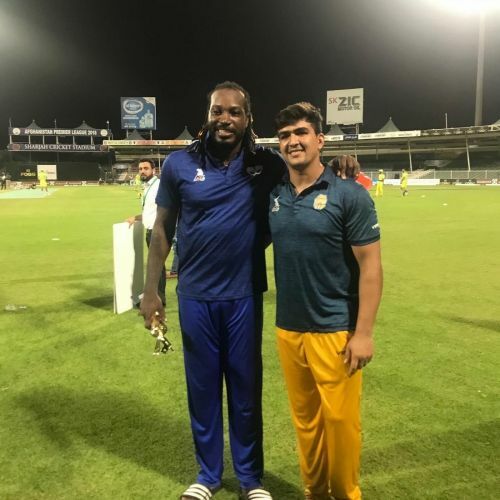 Young Afghan leg-spinner Rashid Khan revealed that during the Afghanistan Premier League (APL) last October, he introduced his compatriot Hazratullah Zazai to West Indies T20 legend Chris Gayle as Afghanistan’s Gayle. Hazratullah Zazai made history by playing an innings of 162 runs for Afghanistan in a T20I against Ireland. Hazratullah used to play in the day and work as a watchman in the night. The southpaw has earned the respect of every cricket fan with his sudden rise as a cricketer. He had impressed everyone earlier with his performances in the APL and the Bangladesh Premier League (BPL) before he shattered records against Ireland. While introducing the "Universe Boss" to his fan Zazai, Rashid drew some comparisons between the two. “Meet Hazrat,” said Rashid Khan to Chris Gayle. “He is a big fan of yours. Back home, they call him Afghanistan’s Gayle,” as quoted by ESPNCricinfo. The next night, Zazai smacked 6 sixes in an over and levelled Chris Gayle’s record of the fastest fifty in a T20 game. Zazai has a strike rate of 168 in T20s, and it seems like he is perfectly following the footsteps of his idol Gayle. The 20-year-old became only the 2nd Afghan player (after Mohammad Shahzad) to hit a T20I century. The dashing opener has quickly become the cornerstone of Afghanistan’s batting order, and the only way is up for him from now on. Zazai has grabbed a lot of attention because of his historic performances and so, we may see him in the IPL 2019 as a replacement player for any franchise. He will be playing for Afghanistan in the upcoming ODI series against Ireland.